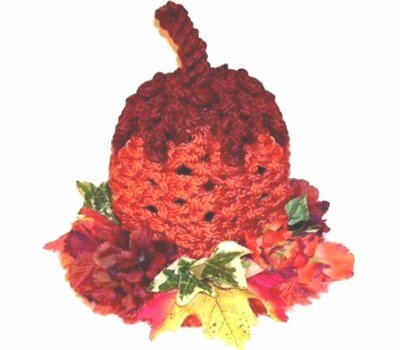 Description: This Pumpkin Decoration will add a special touch to your autumn decorating. It makes a unique centerpiece display. The design has a fringe at the bottom, so you can easily add artificial flowers and leaves. Rust colored material looks the best, but orange can be used as well (Color A). The stem and top area should be dark green or brown (Color B). 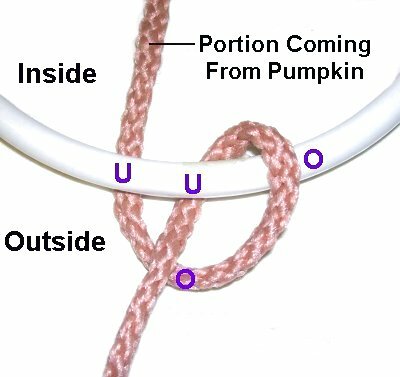 The instructions and cord lengths for this Macrame pumpkin are for a 5 inch size, but can be modified to make it larger. I recommend you try to obtain a wire ball frame, but you can use three rings instead, tying them together at the top and bottom. 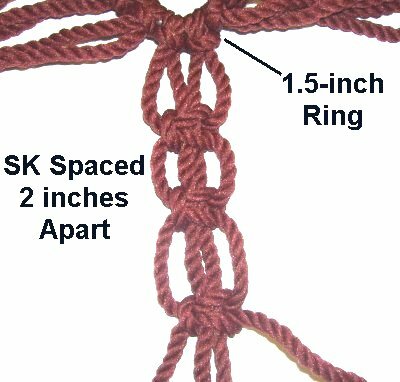 This Macrame project is rated moderate, since you need to be able to tie the knots without securing the cords. 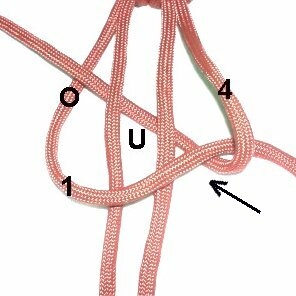 Make sure you practice all the knots until you are completely familiar with them. Use three 5-inch rings if you don't have a wire ball frame. Place them inside each other, bending them slightly as needed. Wrap the top and bottom areas with cord, tape, or wire, right where the three rings meet. When using a wire ball, push down on the top of it until it's the shape you like. Preparation: Since you will be deliberately unraveling the cords in some areas of the Pumpkin decoration, temporarily wrap tape around the ends of all the cords. Size of ball x 4 = Minimum number of cords to cut for the pumpkin (you can cut more). Make sure the final number can be divided by four (24, 28, 32, etc.). The cords should be at least 90 inches long. Cords for top: Increase the length to 60 inches or more. Cords for stem: Increase the length to 45 inches or more. 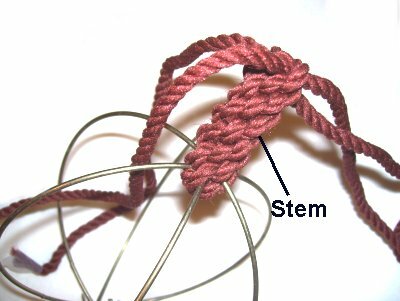 Step 1: You will be making a Crown knot sennit for the stem of the Pumpkin Decoration. 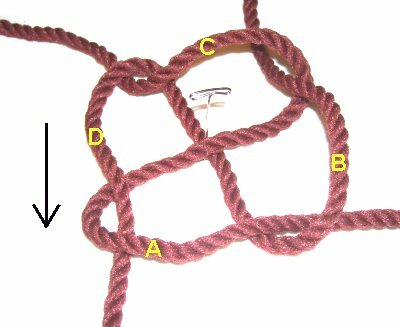 Cross the two 36-inch Color B cords, forming an X shape. Secure them to your work surface, at the center. Mentally number the segments A - D, as shown in the images. << Move segment A to the right, over segment B. There should be a slight curve. 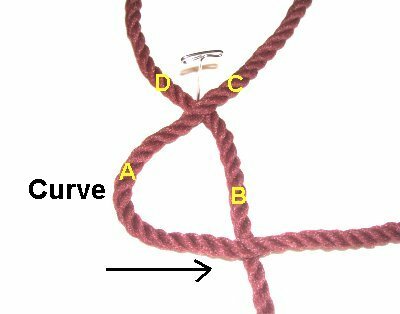 << Move segment C to the left, over segment D.
Step 2: Place the first Crown knot under the wires at the top of the frame, where they connect. Hold it in place while you tie the next Crown knot above the wire. You can apply glue if needed. 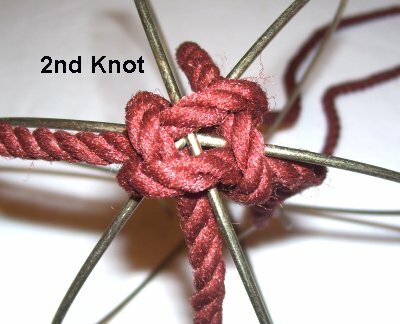 Tighten the second knot as much as you can, so it holds to the frame firmly. Step 3: Tie additional Crown knots until the stem measures 2 - 3 inches. You need at least 4 inches of material to finish the stem at the top of the Pumpkin Decoration, so don't make it too long. Mentally number the cords 1 - 4. Tie cords 1 and 2 together with an Overhand knot. Tie cords 3 and 4 together as well. 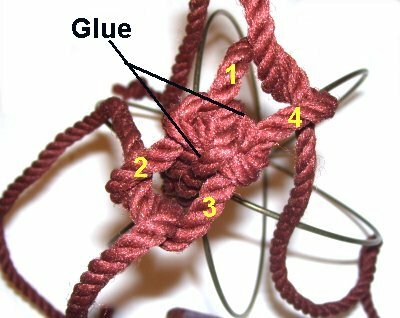 Apply glue before you tighten the knots, so it's on the inside. Tie cords 1 and 4 together. Do the same with cords 2 and 3. 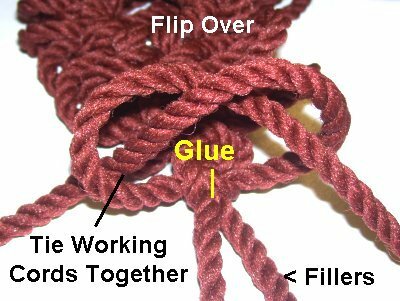 Apply glue inside these knots as well. After the glue is dry, cut off the remaining material, as close to the knots as possible. You can add a little extra glue to the outside if you wish. 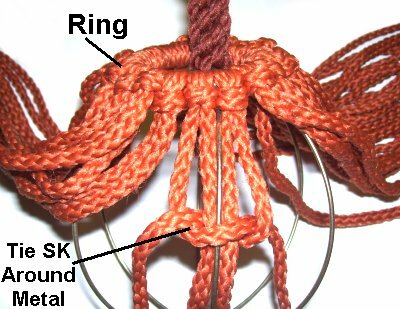 Step 4: Mount the 20 Color A cords for the main area of the Pumpkin Decoration, to the 2-inch ring. Attach them with Larks Head knots, as shown below. It's a tight squeeze, so push the knots closely together. 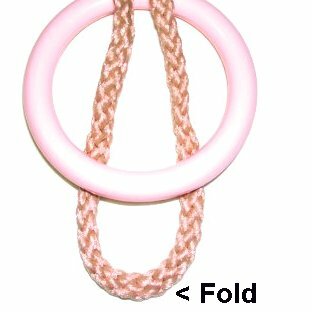 << To tie Larks Head knots, fold the cord and place it beneath the lower edge of the ring. Slide the ring over the stem so it rests at the top of the wire ball. Arrange the cords into groups of four (2 working cords, 2 fillers). 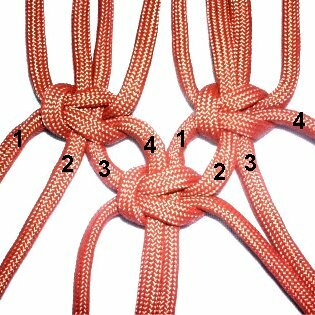 Step 5: Select a group where the four cords rest directly over one of the wires, to tie the first Square Knot (SK). << Mentally number the cords. Move cord 1 to the right, over the fillers (2 - 3) and under cord 4. This is the first half of the SK. 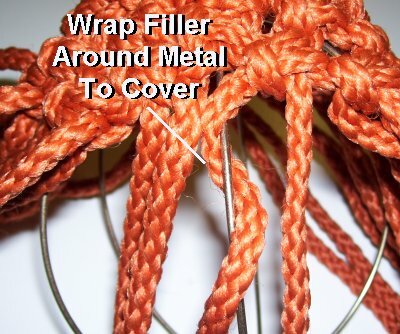 Tie the first half of the Square Knot around the filler cords and the wire. This will anchor the ring to the ball. Tie the second half of the SK around the filler cords only. Step 6: Repeat step 5 on the opposite side of the Pumpkin Decoration. Make sure the ring is balanced. Use the remaining cords, in groups of 4, to tie the first row of ASK. 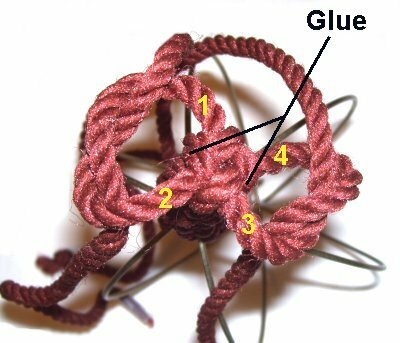 Tighten the knots firmly so they rest very close to the 2-inch ring. Mentally number the cords from 2 knots in row 1. Use cords 3 - 4 from the left SK, with 1 - 2 from the right SK. Tie the new knot with those four cords. Important: In the image above, the two rows have space between them. When you make the Pumpkin Decoration, the knots should be firmly tightened so they are as close as possible. Step 7: Continue on, tying more rows of Alternating Square Knots, until you reach the bottom of the frame for the Pumpkin Decoration. Tie the knots around the filler cords only (not the metal). Important: Whenever you reach spots where the four cords are over the wires, the metal will easily be seen in the space between the knots. Wrap one (or both) filler cords around the wire at least once. 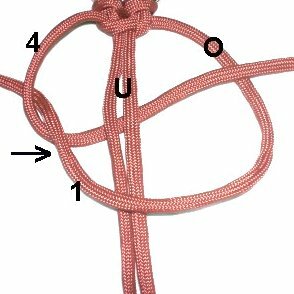 Tie the Square Knot. When you tighten it, push upward slightly. Step 8: Pass all the cords through the 4-inch ring. Attach the cords to the ring with either single or Double Half Hitches. (see image below). The working cords for the last row of ASK must be attached with Double Half Hitches. 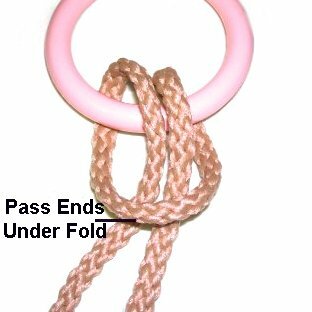 The fillers should be attached with a single Half Hitch. 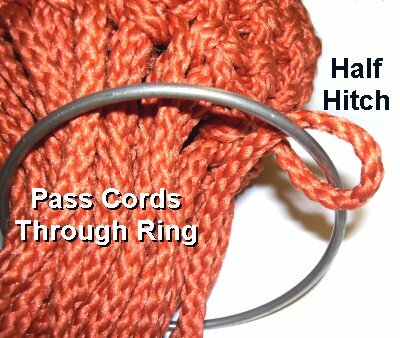 To make a Single Half Hitch, make sure the portion coming from the pumpkin is under the ring. Bring it over - under the ring. As you pull it down, pass it over the cord. 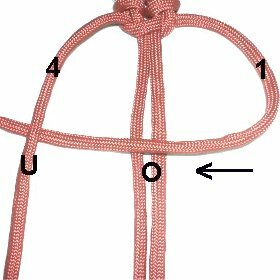 For a Double Half Hitch, tie another one to the right of the first. 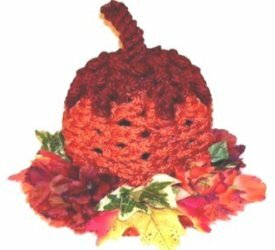 The top of the Pumpkin Decoration is supposed to resemble leaves. So you will be making picots. Each of the 6 leaf designs for the top will fit in the areas between the metal rings. Divide the cords into 6 groups of four (2 working cords, 2 fillers). Design Tip: It's best to make the following design with the cords secured to a work surface. Step 10: Tie 3 Square Knots 2 inches apart. 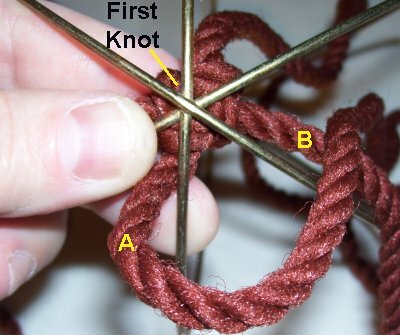 Slide the knots upward, so the first one is next to the ring, and the others just below. Step 11: Switch the cords, so the working cords become the fillers, and vice versa. 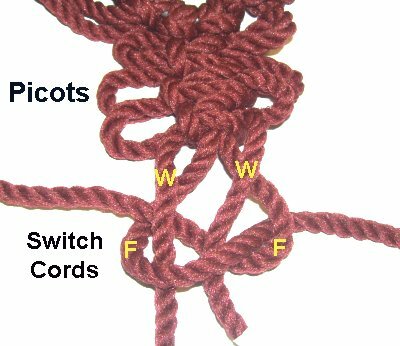 Tie a tight Square Knot with the switched cords. It should rest close to the one above it. Flip over the Picot design. 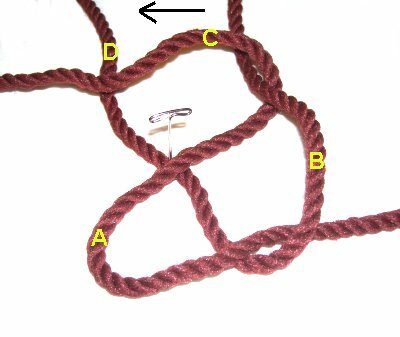 Step 12: Tie the two working cords together with an Overhand knot. 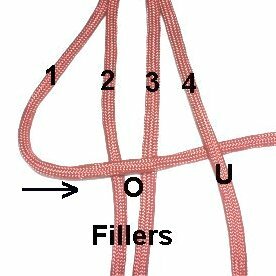 Apply glue to the fillers, so when you tighten this new knot, it rests on the glue. 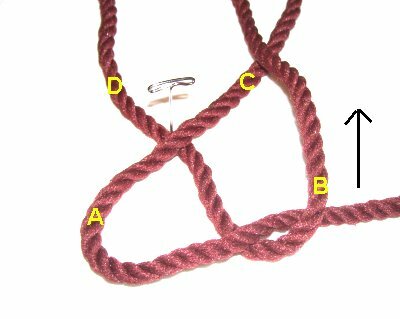 Step 13: Repeat steps 10 - 12 with the remaining 5 sets of cords (total of 6 picot designs). Place the ring over the stem, so it fits inside the 2-inch ring at the top of the Pumpkin Decoration. 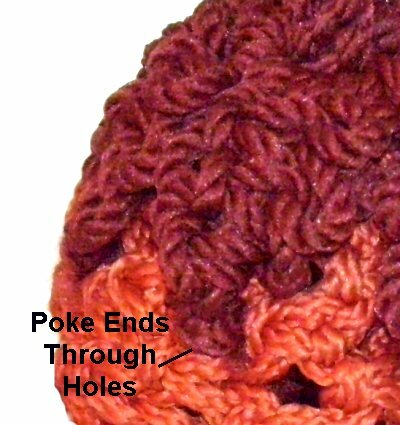 Make sure the picot designs rest between each metal segment, before completing the following step. Step 14: Trim the ends so they are approximately 2 inches long. Poke the ends through a space between the Square Knots, using fine tip pliers. You can add glue to hold them in place if you wish. Trim the cords at the bottom of the Pumpkin decoration to 2 - 3 inches. Separate the fibers and brush them one at a time. Don't want a fringe? Just push all the cords to the inside of the metal frame, and apply glue to hold them in place. Decorate the bottom area with artificial leaves, flowers, pine cones, or other small items. You can apply glue to the brushed fibers, or the lower ring, to hold the decorations in place. Have any comments about the Pumpkin Decoration? Contact Me.